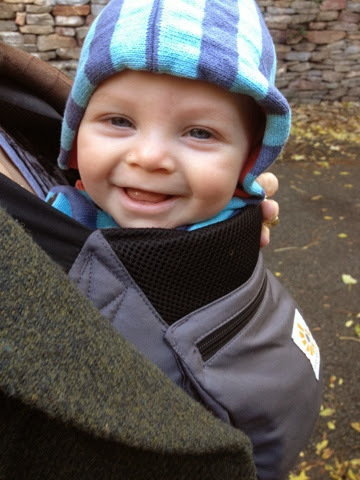 It's nice when you realise that your baby isn't just a screaming little git that needs 24/7 attention, but actually he is a little person who likes things to be a certain way. 06:10 - Drinks a bottle of milk. Now at this point there is a small chance he will sleep again but it's unlikely. You can try and put him down again but he is cunning. He knows that when light is peeping through the cracks of the so-called black out blinds, it's playtime. 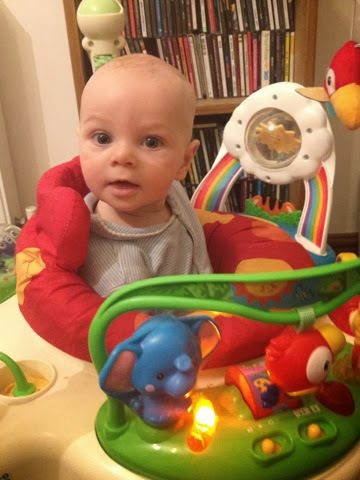 06:30 - Pop him in the Fisher Price Rainforest Jumperoo. Daddy makes himself a strong coffee while the catchy tunes and monkey noises breathe life into the house. Meanwhile the cat attempts to usher me into the kitchen at every opportunity. This gadget really is a godsend in our house and he adores jumping to his heart's content. Revelling in the loud squeaks of the springs as he bounces about, the flashing lights and the monkeys encouraging him to keep going. 06:50 - Time for breakfast. Recently we would put him in the Bumbo and he would sit there waving his arms like a dictator for food, but now he takes great delight in sitting in his high chair. Now feed him a generous portion of Organix Banana Porridge while he repeatedly gets distracted by the cat. 07:00 - Clean, cuddle, and try to compete with the cat for baby's attention. Suddenly remember that if you feed the cat, it goes away. Then time for more cuddles and playtime. 09:30 - Cleaning away the devastation, emptying the dishwasher, and filling it up again. Have mini argument about who is having a bath / getting dressed first. Look after C while the victor goes and gets ready for the day. 10:00 - Juggle C between parents while both parents try to bathe and get ready. It's an enjoyable task deciding what he will wear, and dressing him for the day. 11:00 - Grizzle mode fully activated. Baby needs a nap, and he ain't napping for you unless he's in his car seat being driven somewhere! Jump in car, sigh of relief, baby instantly asleep. 11:30 - Have coffee somewhere. Possibly buy a paper that you know will probably not get read. 12:45 - Realise we haven't made a plan for the rest of the afternoon. Make plan. Quickly act on it. 13:00 - Go for a walk or into the shops. Hope baby has a nap or he will be grizzly later. 16:00 - Get him home, time for some more baby led weaning. Shudder inwardly as baby throws food everywhere and pulps bananas against his new trousers. Yet secretly surge with pride watching him taste and chew on new things with his little bottom teeth. 16:30 - Clean up the devastation, and have more cuddles and playtime. 17:20 - Bathtime. C kicks happily in the water, splashing everything in sight. 17:30 - Baby massage while he gurgles and squeaks, very happy, I think this is his favourite part of the day. Get him changed into his night gear. 17:45 - Read a quick story and feed him half a bottle or so. He falls asleep in my arms in the darkness. 18:00 - Creep out of his bedroom. Wow the shift is over. I have regained my identity and can actually do cool stuff like eat, and relax! 00:00 - Tiptoe into his bedroom with the handheld torch on the controller of the BT Digital Baby Monitor and Pacifier. Make sure the torch is facing away from baby. Fully expect C to be in a strange position in his cot, nowhere near where you first placed him. Smile to yourself when you discover this is true. Pick him up gently and sit down in the comfy chair and give him a dream feed. 00:15 - Put him down in his cot, fast asleep, and creep out of the room. There is normally a sharp cry when he realises he is alone. Daddy's spine tenses, and hopes that as normal it is just one little wail from C and then he will sleep. Feel surge of love because your little creature of habit is so predictable that he even did the little cry. He adores his routine. I love him for being such a little creature of habit, with his own personality, and every time something happens in the routine or he gives me a cue at the right time I feel a little surge of pride for having this person in my life. Liked this? Please comment and subcribe via Bloglovin or follow me on Twitter!